Frequently Asked Questions Regarding Birth Injury Cases | Kennedy Hodges L.L.P. My child suffers from Erb’s palsy after birth, should I pursue a claim for compensation? During the labor and delivery process, many things can go wrong that can ultimately lead to injury to the child. One such example is known as Erb’s palsy. This condition develops when the nerves in a baby’s upper arm are damaged as a result of a lesion located at Erb’s point. Erb’s point is the area near a baby’s neck where the fifth and sixth cranial nerves merge. In order to improve a baby’s chances for the best possible outcome, it is important to recognize the signs and symptoms. It is also important to protect your child’s legal rights and consider pursuing a claim for compensation. Your child has immediate medical and rehabilitative treatment needs that must be met. These needs will typically require funds to be expended, whether it be directly or indirectly. One or both parents may need to take significant time away from working in order to provide the child with the care that he or she needs. This results in potentially substantial amounts of lost income. Your child will have ongoing day-to-day needs as well. These needs may continue for weeks, months, and even years. It is important that there is a source of funds available to cover these costs. While you may be able to provide for your child now, eventually, you may no longer be able to do so. This could be due to disability or death. It is crucial that you set aside funds in order to cover your child’s ongoing care even after you are no longer able to do so. As time goes on, new and cutting edge treatments or tools could become available that could significantly improve your child’s quality of life. Having the funds to pay for these new treatments or tools may have a serious impact on your child. If you do not pursue compensation on behalf of your child, the health care provider who made the mistake that led to the Erb’s palsy is not typically going to notify you or encourage you to pursue compensation. Instead, it is up to you to serve as your child’s advocate. If you are ready to learn more about protecting your child’s legal rights after a birth injury, we are here to provide the guidance that you need. We encourage you to check out our many case results to learn more. My child was diagnosed with cerebral palsy. How do I know whether the doctor who delivered him could have prevented this from happening? When your child is diagnosed with cerebral palsy, your thoughts may turn to whether there was something that could have been done to prevent this from happening. Unfortunately, in some cases the answer is yes. Certain warning signs may have existed during the labor and delivery process that may have gone unnoticed or may not have been responded to quickly enough or properly by your child’s health care team. As a result, your baby may have suffered a brain injury that ultimately led to the cerebral palsy diagnosis that you are now grappling with. For parents whose children suffered birth injuries that were potentially preventable and ultimately led to cerebral palsy, legal action may be taken against the health care providers involved in his or her care. This legal action could ultimately lead to important financial compensation that can help families to afford the best possible health care, counseling, and rehabilitation that will assist a child with cerebral palsy in maximizing his or her potential. Your labor was especially long and difficult. While many mothers prefer to deliver their child vaginally, we are fortunate to live in a time period where surgical interventions can lead to safe and healthy outcomes for both mother and child when a birth does not go as hoped or planned. Health care providers must know when to call for a cesarean section, or C-section, and must do so in a timely manner. If labor extends beyond a healthy period of time or if a vaginal labor could clearly be harmful to the mother or child, it is the doctor’s responsibility to order a C-section to prevent injuries. Your child suffered from something called “asphyxia” during the labor and delivery process. Asphyxia is a condition that develops when a child is deprived of oxygen during delivery. Asphyxia can often cause significant damage to the brain. Ultimately, this may lead to cerebral palsy. Your child suffered from fetal distress during labor or delivery. Fetal distress occurs when the baby’s heart rate begins to fluctuate. Typically, this will sound off various alarms from the fetal monitoring equipment that is typically in place during the labor and delivery process. The equipment will mark sustained spikes and drops in the fetal heart rate. When fetal distress occurs, this is a major red flag of serious issues. Doctors will typically order a C-section take place within 30 minutes or less if this occurs. Your medical team noted the presence of meconium during delivery. Meconium is the medical term for a child’s first bowel movement. When meconium is present during labor, it can be a sign of potential fetal distress. It may also be a sign that complications arose during the delivery, leading to harm to the brain. While the presence of these warning signs alone do not necessarily indicate that cerebral palsy could have been prevented, they are an important factor in your child’s delivery and birth and the ultimate cause of his condition. An experienced attorney will help review and analyze the details of your child’s labor and delivery to establish whether the cerebral palsy could have been prevented, and, if so, who is to blame. If your child received inadequate or substandard medical care, he or she may be entitled to pursue legal action. The compensation that he or she could receive can help to pay for important items including therapy, adaptive equipment, assistive technology, housing, and other benefits that can help improve quality of life. Facing a diagnosis of cerebral palsy is scary for many parents, and beginning the process of pursuing legal action may feel even more overwhelming. Fortunately, we are here to help guide you through this process each step along the way. We encourage you to check out our many case results to learn more. My child has cerebral palsy as a result of an injury he suffered during birth. Do I need a care plan? While the childbirth experience can be stressful for many parents, for some families, the event is associated with a trauma that ultimately leads to their child being diagnosed with cerebral palsy. When this occurs, many parents feel lost as to what to do. One way of coping while also helping your child is to adopt a care plan. A care plan is a road map with the aim of improving your child’s physical, developmental, and psychological development as he grows while living with cerebral palsy. A care plan is put together by the parents with the help and input of several professionals who work to assess a child’s abilities and limitations, decided upon treatments, and come up with accommodations that will improve what your child is capable of doing. Assemble a care team to manage your child’s case. When a child has cerebral palsy, there are many different individuals and organizations that can be of assistance. It is crucial as the parent that you understand what types of support systems are available. You may find that your care plan team consists of health care providers in the home, medical care providers, people who can help you navigate government services, people who can help you navigate the education process, people affiliated with various community support teams, attorneys, counselors, and others. Obtain a formal diagnosis of cerebral palsy. Obtaining a formal diagnosis of cerebral palsy is not an overnight process. You must work closely with your child’s primary care physician in order to obtain the diagnosis, determine the cause of the condition, and establish the form of cerebral palsy. Your child’s doctor will also assess whether your child has associative conditions. Obtain an evaluation to understand the extent, location, and severity of your child’s motor impairment. Once your child has a formal diagnosis of cerebral palsy, the next step is to obtain an evaluation from an orthopedic surgeon. In addition, providers will evaluate your child’s mobility and motor skills, any associated conditions or co-mitigating factors, how he handles activities of daily living, the family dynamics at home, and his overall educational performance. Set goals for your child’s care. After your child has been thoroughly evaluated, the care team can help establish health care goals. Different providers will establish different sets of goals. Some of these goals may be short term, while others are long term. The type of goals may range from educational goals set by school administrators to mobility goals set by the orthopedic surgeon. Categorize your child’s care goals in accordance with care at home, medical care, government assistance, special education, community support and funding, professional services, and transitioning your child into adulthood. It is important to note that “professional services” should include the necessary legal services associated with your child’s condition. Many children with cerebral palsy develop this condition as a result of some form of negligence on the part of the health care providers involved with their birth. In these cases, the child and their family may be entitled to compensation. It is crucial to consult with a knowledgeable attorney who can assist your family through this process. Establish and maintain an ongoing record keeping system. Unfortunately for unknowing parents, medical professionals are only required to keep medical records for a predetermined number of years. Once that timeframe has passed, records can either stored or destroyed. To avoid any issues, we recommend that you keep an at home file of your child’s records. These records are crucial when it comes to setting your child’s goals, evaluating his progress, communicating with other health care providers, and applying for financial aid. These records are also vital in the event that something should happen to you and another caregiver needs to step in as the guardian of your child. He or she will not have had the benefit of being present since the beginning of your child’s health care journey and may need to rely on these records accordingly. The good news for parents of children with cerebral palsy is that most will go on to live long and happy lives. Establishing a care plan can provide you with a guideline as you work to help your child create the best life possible. If your child was diagnosed with cerebral palsy after a birth injury, it is important to take action in order to protect your family’s legal rights. We are here to help. We encourage you to check out our many case results to learn more. I am considering whether to file a lawsuit after my child was diagnosed with Erb’s Palsy. Am I alone? When a woman and child experience a traumatic birth and delivery, Erb’s Palsy is one type of injury that can result. This condition is a type of brachial plexus nerve injury that affects movement and sensation in the arm. When the birth involves pulling, stretching, or tearing of the upper nerves that make up the brachial plexus network, some doctors apply too much force to the neck and shoulders when attempting to complete the delivery. Erb’s Palsy may be the unfortunate result. These injuries often happen during breech or otherwise difficult labors. An Illinois woman alleges that her doctor and other healthcare providers at Alton Memorial Hospital provided her with negligent care during the delivery of her son, resulting in permanent birth injuries. The child now suffers from Erb’s Palsy. In the case, the woman reports that she was induced at the hospital on February 20, 2007. Her physician attempted a vacuum-assisted delivery. Despite using this tool, he was unable to deliver the baby’s posterior shoulder from the birth canal. The baby developed Erb’s Palsy, brachial plexus injuries, and a broken clavicle as a result of the traumatic delivery. A mother in Mississippi accused her physician of negligence leading to Erb’s palsy in her child. In late October, the mother filed a lawsuit against the doctor who attended the birth of her daughter. She also filed suit against the hospital where the birth occurred. In her suit, the woman accuses the doctor and the hospital of negligence that resulted in her daughter becoming permanently disabled. She was admitted to the hospital on November 7, 2012, to give birth. During the course of her labor, complications arose. The woman asserts that her medical team failed to recognize or determine the true size of her baby. In addition, the team allegedly did not contemplate using alternative birthing methods to keep the mother and child safe, such as a Caesarian section. Further, the medical team applied fundal pressure to the woman’s abdomen in an attempt to speed up the delivery process. The attending physician also reportedly pulled on the infant’s head in an attempt to get him out. The plaintiff in the case claims that the medical team breached the standard of care when it took these actions. As a result, she states that her daughter developed Erb’s Palsy secondary to shoulder dystocia. A Delaware woman claims that her doctor and health care providers committed medical negligence during the labor and delivery process on the day that her son was born. She states in her complaint that her son presented with shoulder dystocia during the delivery. She further claims that her physician, Dr. Peter J. Wong, applied excessive downward traction that resulted in Erb’s Palsy with C5-C6 upper trunk avulsion and suprascapular nerve injury on the child’s right side. When an infant’s shoulder becomes wedged behind the mother’s pubic bone, this is known as shoulder dystocia. As seen in the cases above, shoulder dystocia is clearly commonly associated complications that are later linked to Erb’s Palsy. When shoulder dystocia occurs, it is crucial for physicians to take the proper actions in order to protect the mother and baby. Doctors must respond appropriately and quickly in order to prevent long-term disability to the child. Unfortunately, some do not take the proper actions, such as ordering an immediate Caesarean delivery. If your child was diagnosed with Erb’s Palsy following a difficult labor and delivery, your physician may be responsible. It is important to take action in order to protect your family’s legal rights. We have helped many victims and their families pursue claims for compensation. We encourage you to check out our many case results to learn more. Am I entitled to compensation for the cost of my child’s treatment for Erb’s palsy? Following a difficult labor and delivery, your child may suffer from a birth injury known as Erb’s palsy. The impact of this type of injury can range from mild to severe. Many babies suffering from Erb’s palsy require extensive treatment in order to recover. Patients are often referred to a treatment center where they are overseen by a team made up of neurologists, neurosurgeons, physical therapists, occupational therapists, and orthopedic surgeons. Surgery. When surgery is recommended, it is usually performed within the first three to six months after birth. Exploratory surgery. This type of surgery is typically performed to remove scar tissue and neuromas in an attempt to repair the affected nerve. The doctor may also transplant a nerve from another part of the body in an attempt to repair nerve ruptures. Physical therapy. Erb’s palsy patients are often treated with gentle massages around the affected arm, range of motion exercises to improve arm strength and flexibility, and exercises to address nerve function. Botox injections into the affected area. Application of electrical stimulation to the affected area. Home care. Parents of Erb’s palsy patients are often instructed to gently massage their baby and perform physical therapy exercises while at home. Unfortunately, the costs associated with these treatments can add up quickly. Victims and their families may need to pursue a legal claim against the delivering doctor or hospital in order to obtain compensation for these and other costs. We are here to help. Check out our many client testimonials to learn more about how we have helped other families obtain the compensation that they deserve. What is the long-term impact of a birth injury resulting in Erb’s Palsy? If your baby was injured during delivery, he or she may suffer from a condition known as Erb’s Palsy. Erb’s Palsy is a form of brachial plexus disorder resulting from nerve damage in the baby’s upper arm during delivery. The affected nerves give movement and feeling to the baby’s arm, hands, and fingers. As a result, babies with Erb’s Palsy may have issues with the spinal cord’s ability to send messages to the arm, wrist, hand, or fingers through normal nerve impulses. Mild cases of Erb’s Palsy may resolve in 3-6 months if the baby undergoes physical therapy treatments. Approximately 70-80 percent of Erb’s Palsy cases resolve within one year from birth if the baby receives proper and consistent treatment. A positive sign that the condition will resolve is if the infant is able to grasp objects or make fists with the affected hand during treatment sessions. A smaller percentage of babies will face lifelong problems caused by their Erb’s Palsy. This may include permanent loss of function in the arm and abnormal muscle contractions. These children may have difficulty participating in sports and other activities. Psychologically, some babies who suffer from Erb’s Palsy may face long-term self-esteem issues, difficulty with performing tasks, and feelings of anger and frustration. It is important to note that the younger a patient begins receiving treatment, the better the long-term prognosis will be. Even where the condition is mild, babies who suffer from Erb’s Palsy require significant medical treatment and therapy. It is therefore crucial that parents pursue all of their legal options for compensation. Fortunately, you may have grounds for a claim if the condition was caused by the negligence of the delivering physician. How much compensation am I entitled to if my baby suffered a brachial plexus injury during birth? When a baby suffers a brachial plexus injury during birth, the injury may be mild, moderate, or severe. Some fortunate babies will heal naturally with time. Others, however, require long-term treatment and may never fully recover. Parents of these babies may be entitled to compensation if the injury was caused by the negligence of the treating physician. The extent of the compensation that may be received depends on the severity of the injury and facts and circumstances surrounding the birth. While these injuries may create immediate financial burdens on families, it is an unfortunate reality that some brachial plexus birth injury claims can take many months or even years before a resolution is reached. Therefore, it is important that you act quickly with regard to seeking qualified legal assistance. In addition, these claims are subject to time limitations under state law. Fortunately, we are well-versed in assisting parents through the difficult process of pursuing a legal claim after a birth injury. We encourage you to reach out today for a complimentary case evaluation of your matter. Are there different types of cerebral palsy in which my child could be suffering? Your baby boy just turned six months old and although he is absolutely perfect in your eyes, you’ve noticed some alarming signs that there may be something wrong with him. Ever since he was born he has had slight muscle tremors that your doctor brushed off as nervous twitches. However, over the past several weeks, the tremors have gotten exceedingly worse, followed by moments of what appears to be temporary paralysis. You called your doctor, but he assured you that you were probably just overreacting. Overreaction or not, his comments weren’t going to keep you from finding out what was wrong with your precious baby. You decided to get a second opinion and took your baby to a friend’s pediatrician. What you discovered was horrifying: after several hours and numerous tests, the doctor diagnosed your son with cerebral palsy (CP). Cerebral palsy? How could this have happened? As you were trying to make sense of the situation, the pediatrician informed you that she would have to perform a few more tests to narrow the diagnosis down to which specific form of palsy he was currently suffering from. Which form? There’s more than one? So now not only must you worry about the diagnosis itself, but whether he has the worst type or a mild form—all while hoping for the best. The National Institute of Health defines cerebral palsy as a group of neurological disorders that appear in infancy or early childhood, and permanently affect body movement and muscle coordination. Although the abnormalities affect the muscles, the disorders are actually caused by irregularities in the brain that formed during pregnancy or delivery. In many cases, cerebral palsy results from hypoxia (lack of adequate oxygen flow to the brain) during delivery distress. Spastic quadriplegia – When both arms and both legs have some degree of impairment causing tremors or jerking, limiting the ability to walk. Spastic diplegia – Impairment in the legs, but minimal or no impairment of the arms, causing an increased risk for hip problems and leg soreness. Intelligence and communication skills remain unaffected. Spastic hemiplegia – When one side of the body—the opposite side of where the brain was injured—is affected, causing abnormal movement and paralysis. Ataxic cerebral palsy causes small (called hypotonia) tremors which affect and target specific motor skills such as writing, balance (especially when walking), hearing, and vision. On average, about 10 percent of cerebral palsy victims suffer from ataxic cerebral palsy. This type of cerebral palsy has mixed muscle tension that can vary from low (hypotonic) to high (hypertonic). This causes writhing movements or seizures of the hands, torso, and body. These tremors drastically limit motor function, communication, and specific motor skills. It affects approximately 20 percent of patients. Mixed cerebral palsy occurs when multiple areas of the brain are injured, resulting in a combination of the three major types. These injuries can occur either during pregnancy or delivery. Multiple injuries and multiple CP types are rare—less than five percent—but are extremely devastating since they can affect the entire body, as well as brain functions. Your baby deserves to start his life with the best possible chances. However, if delivery complications, or poor pre-natal care causes him to suffer a brain injury, he could wind up living his entire life with the consequences of someone else’s mistake. Don’t let that happen. 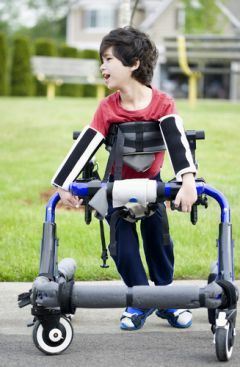 If your child suffers from one of the above forms of cerebral palsy, he may be entitled to malpractice compensation. Contact us today for a free consultation and review of your case. Our experience and knowledge with birth injury claims can help him get the treatment and justice he deserves to improve his chances in life. Call today to see how we can help. You can also help your friends and loved ones learn about cerebral palsy by sharing this page on your social network. Simply click the Facebook, Twitter, and Google Plus icons to show your support.